Our College Flags measure 3'x5' and include two metal grommets to fly from a traditional flagpole, one of our tailgate flagpoles, or aluminum 6' flagpole. We offer various levels of quality in our College Flag line including nylon or poly construction options, quadruple or double stitched flyends, and school insignias which are embroidered, appliqued, or screen printed. 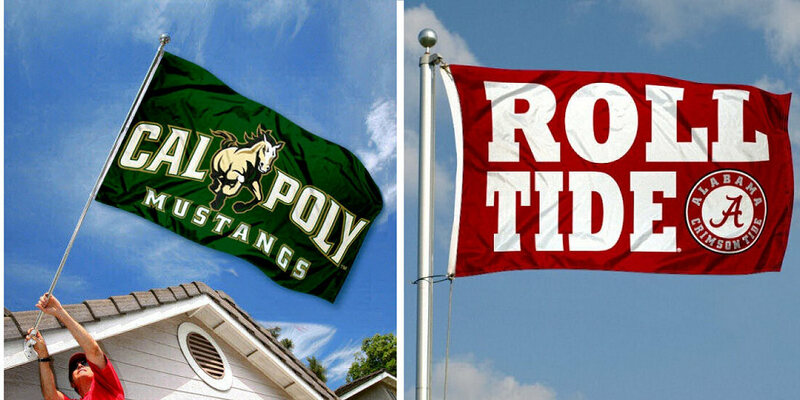 All College Flags are viewable on both sides and our Stadium Flags are two-ply constructed, so they are viewable and readable correctly on both sides. Finally, all College Flags are NCAA Officially Licensed by the selected university which ensures authentic school insignias, colors, updated logos, and top quality. With our various levels of quality, pricing, sizes, and variety of logo designs, College Flags and Banners Company will be your college flag source.